A modern version of the classic characters from the popular Hardy Boys children’s mystery books. 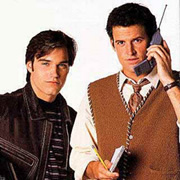 Young Frank Hardy (Colin Gray) works for a newspaper while his brother Joe (Paul Popowich) is a college student. Together, they solve a variety of mysteries and crimes.